The boy-child holding court with his great grandmother. 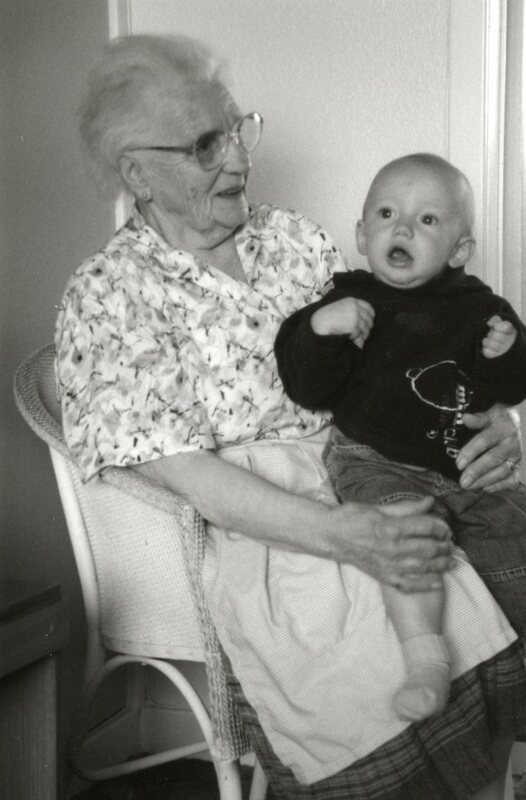 Yesterday would have been my gran’s 107th birthday. There was a time when I could almost have believed she would live to 107; she seemed for so long to have such energy and strength. But she died a few days short of her 98th birthday — having moved from her own house into a care home a year or so before. 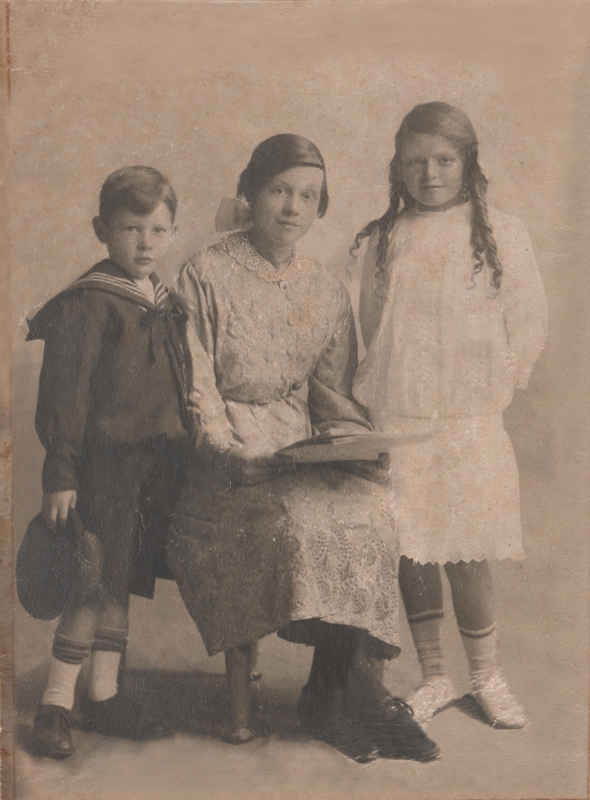 Margaret Simpson Bissett Cruden (11 May 1908 – 1 May 2006) was the eldest child and only daughter of Alexander Cruden and Catherine Simpson Bisset Black. My great grandparents were very young when she was born; Great Gran was 18, Great Grandad still 17. Margaret had four younger brothers; Stewart, Alexander, James and George, the youngest of whom was born just a few months before my gran herself became a mother. 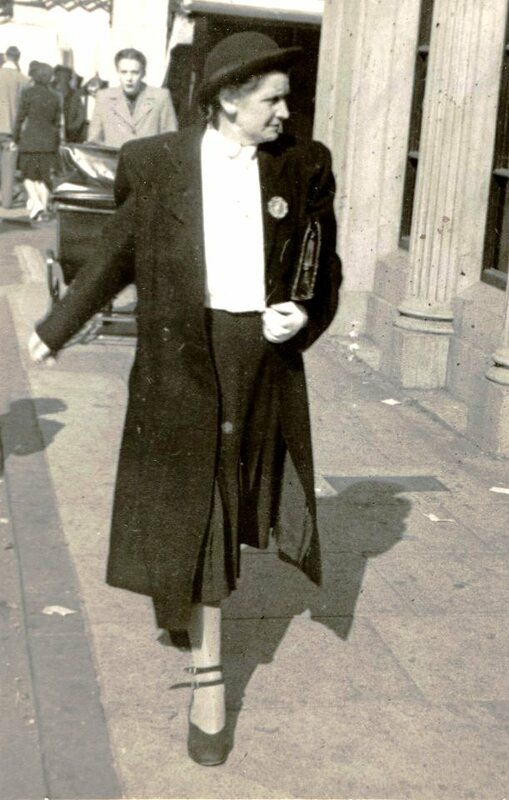 Gran was born and raised in Dysart, Scotland and lived all her life in Dysart and Kirkcaldy. 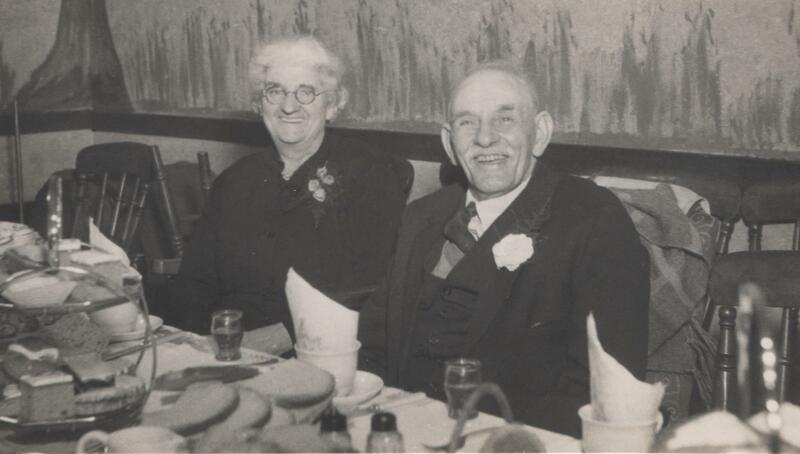 She married my grandad (David Skinner Ramsay) in 1927, when Grandad was 25 and she was 18. They raised six children; a son David, and five daughters – Catherine, May, Margaret, Elizabeth (my mum) and Sandra. Ramsay family portrait. 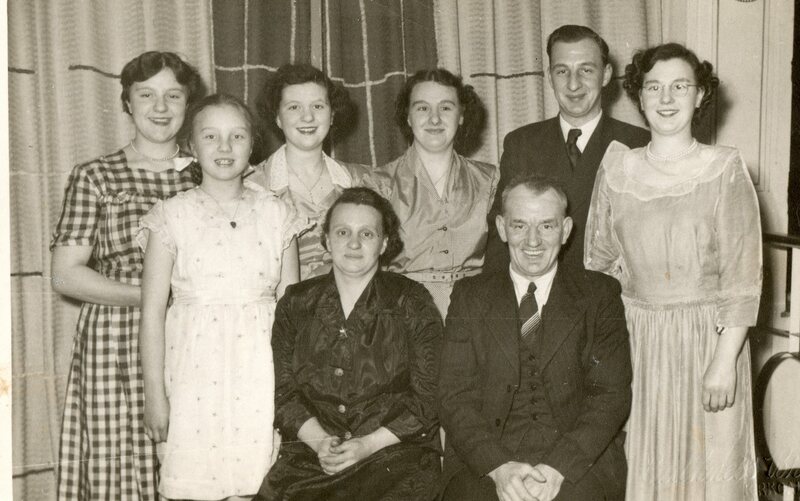 Standing (l-r): Elizabeth, Sandra, Margaret, May, David and Cathy. 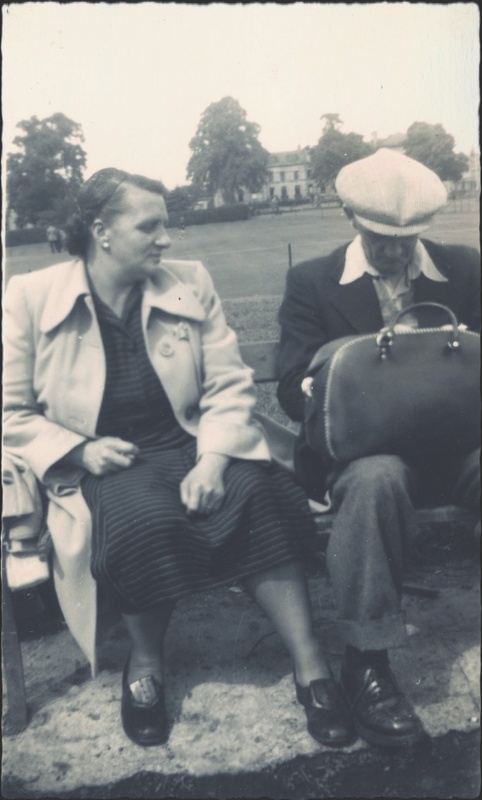 Seated Margaret Cruden and David Ramsay. Photo: Ramsay Leslie family archive. Grandad was a coal miner, who, in later life, suffered from diabetes. Because of that he had both legs amputated at the knee after small wounds turned gangrenous. 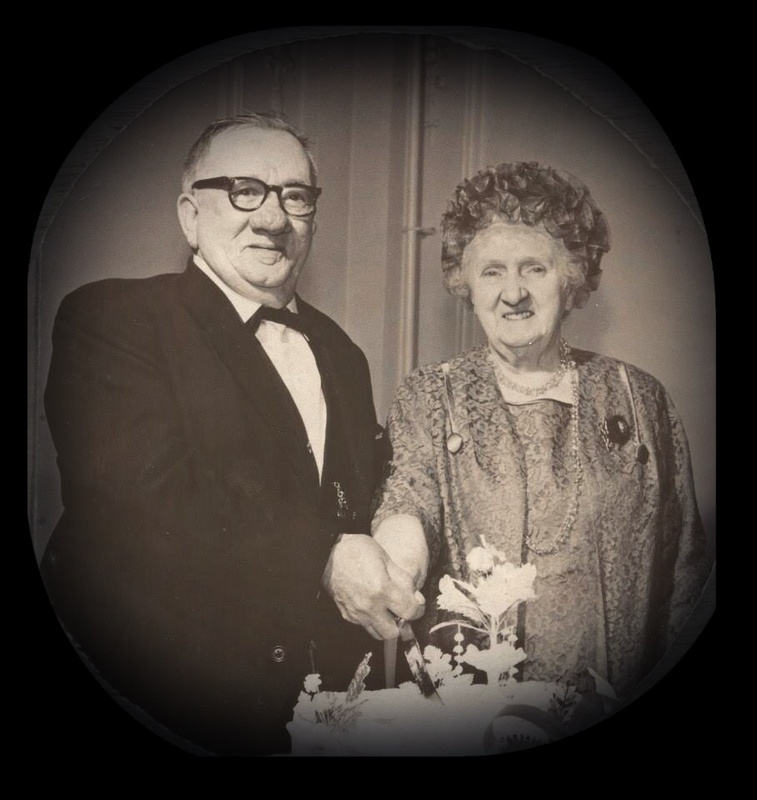 My gran was relatively young when she found herself nursing an invalid husband; a role she took on without hesitation and carried out with great love and care until my grandad’s death in 1973. Margaret Cruden and David Ramsay, Dunnikier Park Kirkcaldy, Fife, Scotland. Photo: Ramsay family archive. 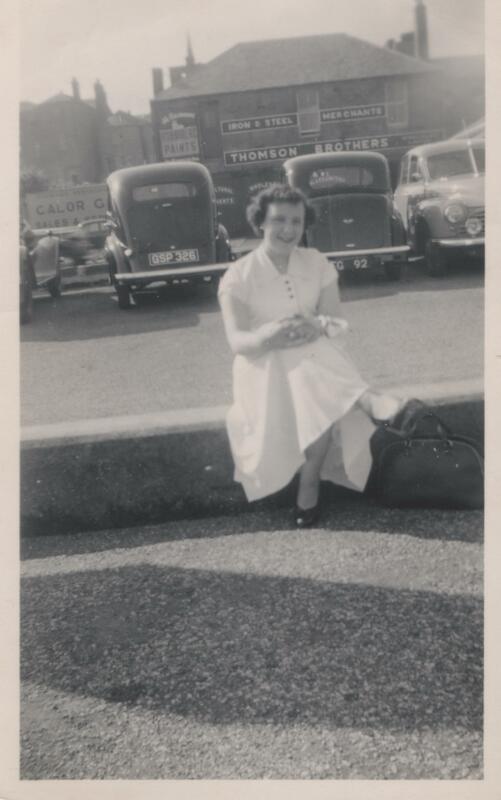 After his death, my grandmother left the UK for the first (but not the last) time. She travelled to New Zealand to visit my family and to Australia to stay with her brother Alexander and his family. 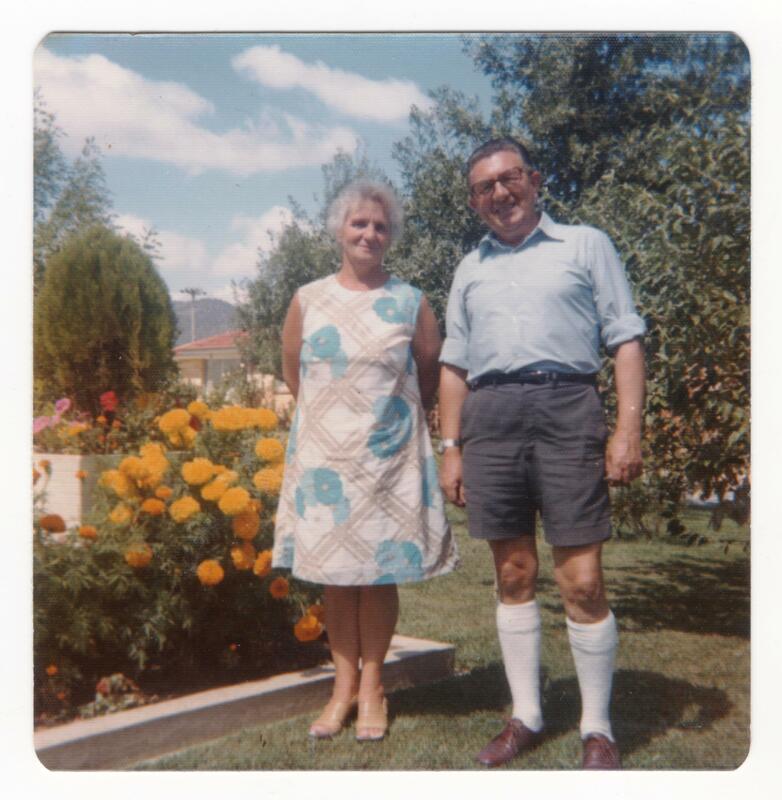 During the next thirty years she travelled again to Australia, to Zimbabwe while it was still Rhodesia and in the midst of civil war, and to Switzerland to visit one of my cousins. She also traveled extensively around the UK visiting family. Siblings, Margaret and Alexander Cruden, Australia c. 1974. 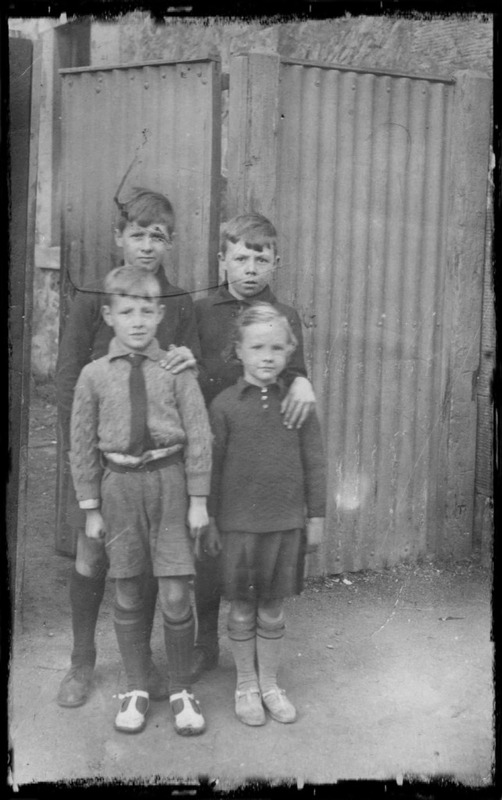 Photo: Ramsay family archive. I only really got to know my gran in my late twenties and thirties while I was living in the UK. We spent hours together drinking tea, eating meringues (her favourite sweet) and gossiping. She was a lovely little barrel of a woman; about 4′ 10″ (1.47 metres), and solid (I definitely take after her). She was quick-witted, a good story teller and could be very funny, although she also possessed a very sharp tongue — as anyone on the receiving end of it would tell you. 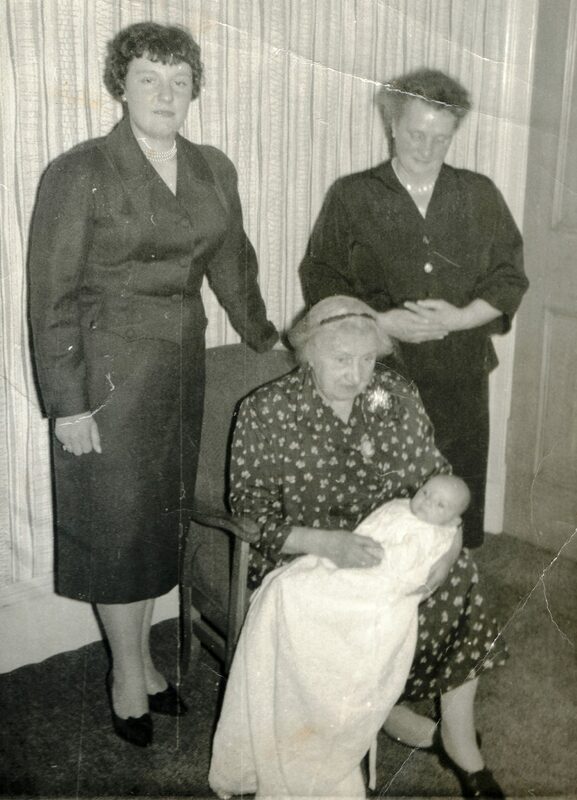 Four generations: My christening, with my mother Elizabeth Ramsay, grandmother Margaret Cruden and great grandmother Catherine Black. c. 1961. Photo: Ramsay Leslie family archive. She really was a force of nature; a matriarch who spend almost 80 years looking after her family. She is remembered with great love by a global tribe consisting of not only myself, my siblings and cousins, but our children and the children and grandchildren of Gran’s brothers — who still speak fondly of their “Auntie Maggie.” She had 17 grandchildren, 28 great grandchildren and was great, great grandmother to two newborns by the time she died. 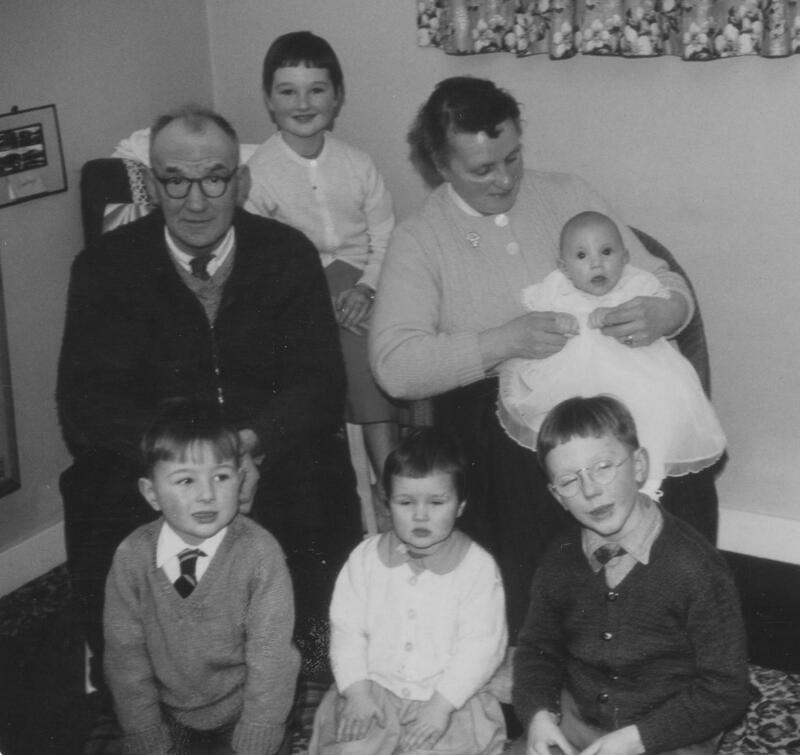 David Ramsay and Margaret Cruden with grandchildren Margaret Ladyka (back), Ian and Sandra Ladyka (front left and centre) and Robert Guthrie. The baby is me. c. 1961. Photo: Ramsay Leslie family archive. My son only got to meet his great gran once; he was very young, but claims to remember her (she told him off, so I’m not surprised it stayed in his mind). I’m sad that she died two months before we were due to go back to the UK for a visit. My son was eight by then and would have enjoyed another encounter with that feisty, four foot ten force of nature. This week’s Daily Post Weekly Photo Challenge theme is forces of nature. I think my gran qualifies. You can find out more and see other bloggers’ interpretation of the theme here. Am having brain fade today; posting to the “wrong’ blog. But perhaps there is crossover? 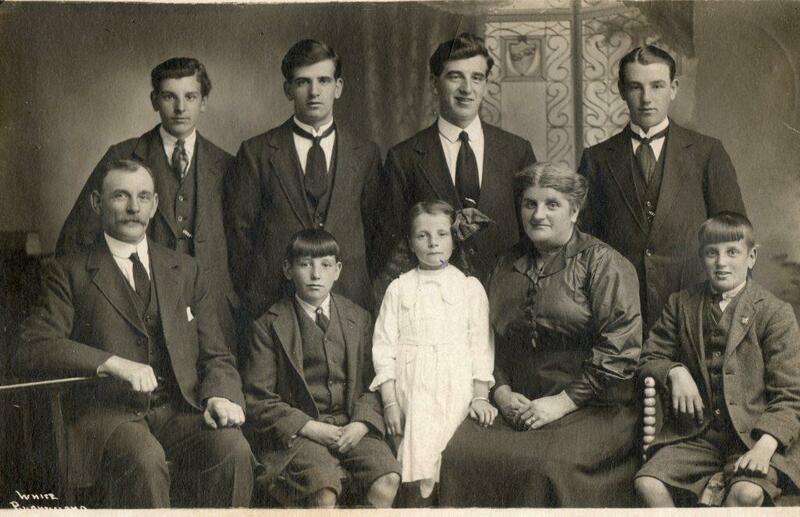 James and George Cruden (back row) with David and May Ramsay — their niece and nephew. Photo probably taken in Dysart, Scotland. c. early 1930s. From Ramsay family archive. My maternal grandmother was the oldest of five children. 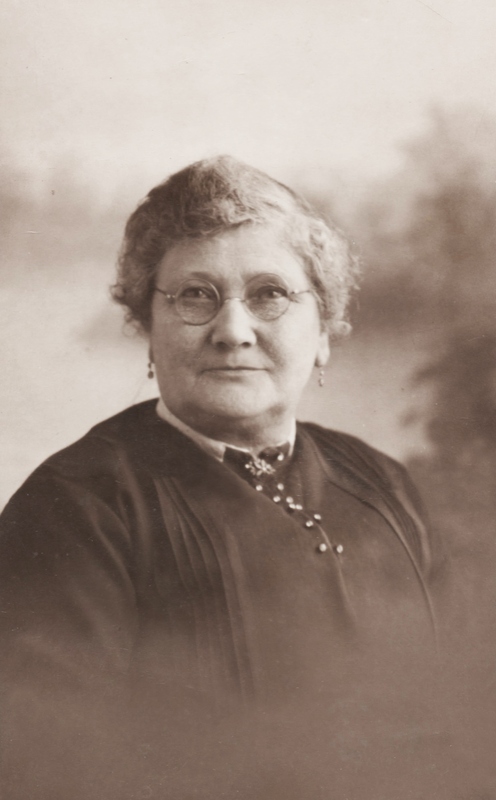 She married young and had her first child at around the same time my great grandmother bore her last. I wonder if my aunt May and Uncle David (front row) referred to their playmates (standing behind) as Uncle Jim and Uncle George? 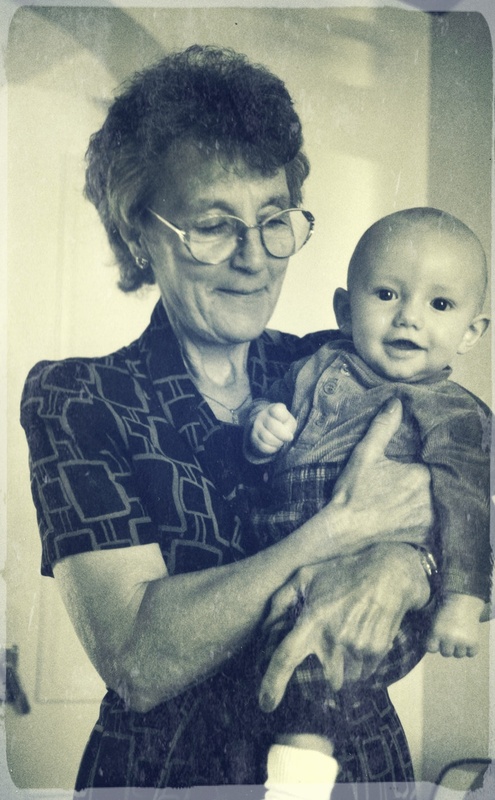 My son with his grandmother, 1998. Photo: Su Leslie. It’s been a few years since the boy-child spent time with my mother, who now lives in the UK. Mum played a huge part in my son’s early life and both she and the boy are excited about our trip to England in a few weeks. 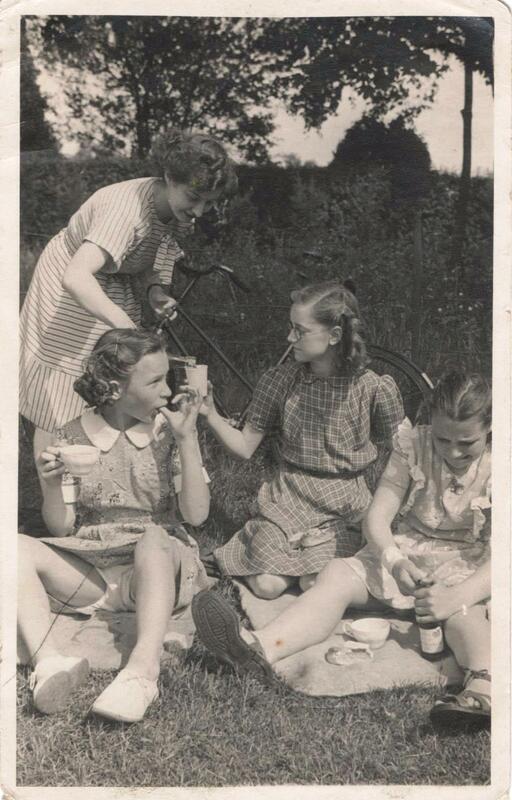 School-girl picnic, Fife, Scotland, c. 1947-48. My mum (far right) and friends. 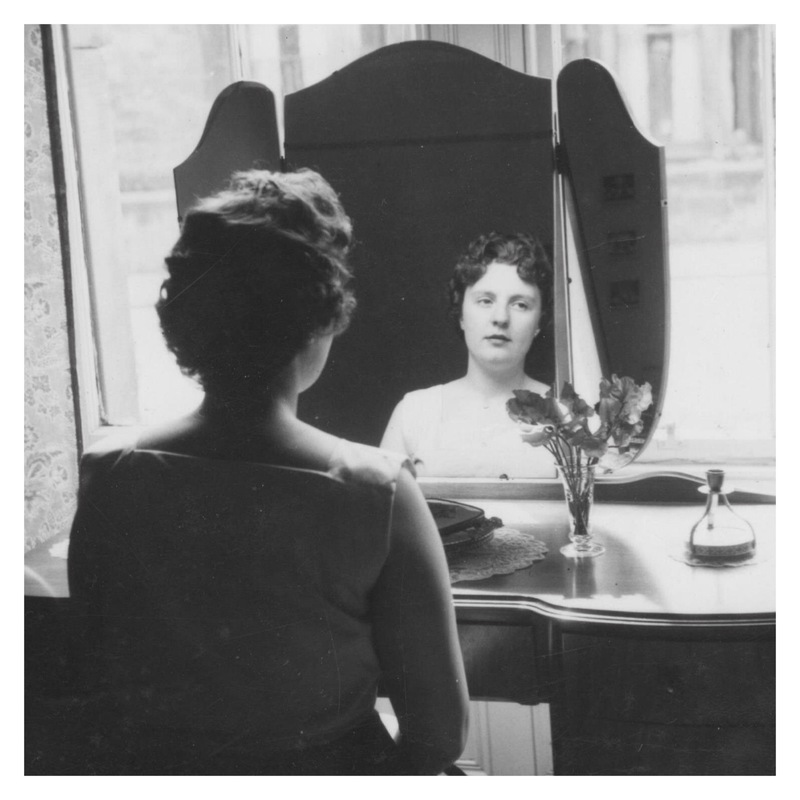 My mother at her dressing table, c. 1956, Kirkcaldy, Scotland. Photo: Leslie family archive.